Most people think that the biggest felony made by Bill Clinton might be that he swore falsely under oath in the Lewinsky affair. But this is peanuts compared to the real crimes, yet undetected by most American people. It was in Oxford as a student Clinton came to hear about the One World Government for the first time, and what was required to be a member of this New World Order. In an interview in 1994 Clinton said that he'd known about the "Shadow-government" already in his youth, and had been very enthusiastic to get an entrance into the "Inner Circle" and from there have the opportunity to participate in decisions regarding the future of the world. He succeeded! The "President-maker" David Rockefeller met Clinton in the mid 80's in Arkansas to prepare him for what was to come. The State of Arkansas, by the way, is a major seat for the Brotherhood elite. The south branch of the Scottish Rite of Freemasonry has its center here, and from this area Albert Pike (33 degree Freemason) created the Ku Klux Klan. Clinton worked himself up rapidly and became a governor of Arkansas. 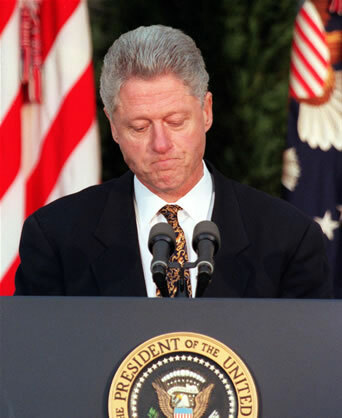 As a governor Bill Clinton committed a series of high crimes, related to his Illuminati connection. He became the leader of a gigantic network which dealt with drug-smuggling, laundering of drug-money and corruption in general. A good friend of Clinton from Arkansas, Larry Nichols, was interviewed in a film. Clinton thought that Nichols would keep his mouth shut, but he didn't. He was hired by Clinton and had found out that Clinton's firm, "Arkansas Development Finance Authority" (ADFA), laundered drug-money. Cocaine to a value of $10.000.000 (ten million dollars!) a week was flown in from Mena Airport in Arkansas. The money was laundered via ADFA to a bank in Florida, to a bank in Georgia, to Citycorp in New York, and from there it was transferred out of the country. All this regarding to Larry Nichols. Clinton's best friend, Dan Lasater, led the operations. Lasater and Bill Clinton's brother, Roger Clinton, later spent time in jail due to drug related crimes. The Chief of Police in Arkansas at that time, Doc Delaughter, said he had gathered information from many persons in Lasater's surroundings, how he smuggled drugs and abused young girls sexually. During those investigations Doc was harassed by persons from his own police department, paid by Clinton. The first loan ADFA approved was to "Park-O-Meter" ... When I investigated the company, I found that the Directive Secretary and cashier was Webb Hubbell ... Guess who wrote the law proposition ... which made ADFA possible. Webb Hubbell. Guess who drove the law proposition which looked into- and admitted (Park-O-Meter's) request. "Rose Law Firm" (owned by Hillary Clinton). Who signed the admittance? Webb Hubbell and Hillary Clinton. Nichols said that when journalists started investigating the loans to "Park-O-Meter", they discovered that the company did not make parking meters, but removable airplane nose-cones, delivered to the air-field in Mena. The equipment was used to smuggle narcotics into the country, and with this Clinton and his companions participated heavily to the pushing of street-drugs in the USA. Nichols says further that Clinton most of the time was involved in drug trade and the people he surrounded himself with followed him all the way to the White House.